I sell candy and chocolate on Ebay and I would like to be mentioned on your site, How do I go about it? I love to make candy and we have a really nice growing list of customers. I have been selling on Ebay for 3+ years. I would love to be listed on your site. Please email me for the information. I would not want to presumptuously leave it here. Look forward to hearing from you. I do have a section for those looking for chocolate on eBay with a listing of current auctions for different chocolate candy categories. The listing is just an RSS feed showing the live auctions for my visitors' convenience. I don't really have it set up for individual ebay sellers to place their particular auctions directly on my site. 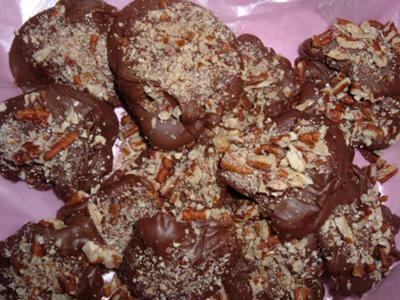 However, I will send you a personal email regarding the possibility of setting up a private agreement for promoting your chocolate pecan clusters and other signature candy that you make here at Chocolate Candy Mall. Perhaps we can come to an arrangement that will benefit us both. Thanks for telling us about your delicious chocolate on ebay treats!